On Friday the Department of Labor will release data on the union status of the American workforce. Unfortunately the data are likely to show a decline in the percentage of workers who are unionized because of the one-two punch of long-term trends—such as the escalation of aggressive employer campaigns against union representation—and political attacks such as Wisconsin’s new law banning public-sector collective bargaining. Even though less than 12 percent of all workers are currently union members, Americans—whether unionized or not—should care about this decline because unions give workers a bigger say in our economy and our political system. That helps the middle class, and it’s good for democracy. As our research and a number of academic studies find, unions strengthen the middle class and significantly reduce economic inequality. In fact studies indicate that the decline in union density explains as much of today’s record level of inequality as does the increasing economic return of a college education. Most research on the importance of unions to the middle class tends to focus on how unions improve market wages for both union and nonunion workers. This research is no doubt vital, but it gives short shrift to the critical role unions play in making democracy work for the middle class. Unions help boost political participation among ordinary citizens—especially among members, but also among nonunion members—and convert this participation into an effective voice for pro-middle-class policies. This explains why states with a greater percentage of union members have significantly higher voter turnout rates, as well as higher minimum wages, a greater percentage of residents covered by health insurance, stronger social safety nets, and a more progressive tax code, as charts in this brief will illustrate. Even though unions weakened, they are still critically important to the middle class: The states with the lowest percentage of workers in unions—North Carolina, Georgia, Arkansas, Louisiana, Mississippi, South Carolina, Tennessee, Virginia, Oklahoma, and Texas—all have relatively weak middle classes. In each of these states, the share of income going to the middle class (the middle 60 percent of the population by income) is below the national average, according to Census Bureau figures. This issue brief digs deeper into these findings by highlighting the critical role that unions play in making the political system work for the middle class. They do this in two key ways: increasing voter participation and advocating for policies that help the middle class. As an increasing number of citizens feel their democracy is no longer responsive to their needs, the role unions play is ever more important. Unions help get ordinary citizens—union and nonunion alike—involved in politics by, for example, knocking on doors, educating workers on the issues, and helping them feel their efforts will make a difference. Case in point: A 1 percentage point increase in union density in a state increases voter turnout rates by 0.2 to 0.25 percentage points according to analysis by Benjamin Radcliff and Patricia Davis, political scientists at the University of Notre Dame and the State Department, respectively. In other words, if unionization were 10 percentage points higher during the 2008 presidential election, 2.6 million to 3.2 million more Americans would have voted. Similarly, research by Roland Zullo, a labor studies professor at the University of Michigan, shows that self-described working-class citizens—whether unionized or not—are just as likely to vote as other citizens are when unions run campaigns in their congressional district. Yet when unions don’t run campaigns, working-class citizens are 10.4 percent less likely to vote than other citizens. A similar pattern holds for communities of color. Voters of color are just as likely to vote as white voters in districts with union campaigns but are 9.3 percent less likely to vote in districts without campaigns. Figure 2 below shows that states with higher levels of unionization have higher levels of voter turnout by highlighting the relationship for all federal elections from 1980 to 2010. This relationship would also hold if we were to look at only presidential elections or only midterm elections. Other factors contribute to voter turnout, but unionization certainly plays an important role in getting the vote out. Unions play a critical role in getting ordinary citizens involved. 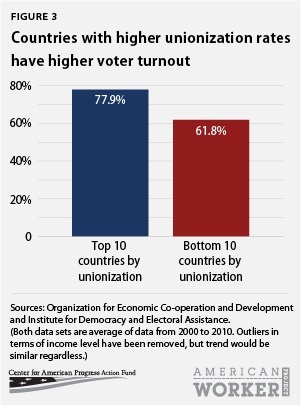 The United States has one of the lowest voter turnout rates in the industrialized world, an average of 56.9 percent, and one of the lowest rates of union membership, an average of 12.1 percent in the 2000s, as Figure 3 shows below. 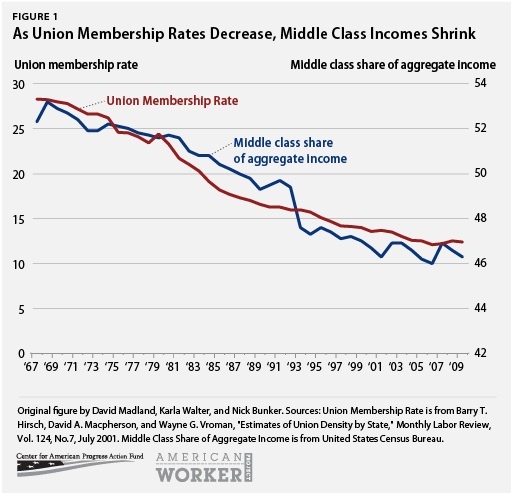 If union membership continues to decline, the quality of our democracy will as well. Before people take political action, they must think it is worthwhile—that the benefits are greater than the costs. But the costs of action—time, money, and energy—are sometimes higher than the benefits of action. This is especially true with actions such as writing a letter to a member of Congress or tracking the progress of a bill, but it can hold true even for an action as simple as voting. This is why in many cases, people rationally decide that they are better off doing nothing, which in turn often means they don’t vote or take other political actions. Unions help decrease the costs and increase the benefits of participation so that more people get involved. They do this in a number of ways—from simply knocking on doors and letting people know about an election and providing information about an issue to helping people get to the polls or write a letter and making people feel more powerful and thus likely to succeed. Relatively few people participate spontaneously in politics but rather are likely to take action when groups such as unions mobilize them to do so. As a result being a union member makes a person more likely to vote and participate in politics, but unions also increase participation among nonmembers. Nonunion members are often the recipients of union efforts to educate and mobilize. Getting middle- and working-class citizens to vote and otherwise get involved in democracy is especially important because higher-income people are much more likely to participate in politics than the middle class. Making democracy work for the middle class involves more than getting citizens involved in the political process, however. Ordinary citizens also need some level of influence over which policies are actually debated, their final structure, and whether they get passed or not. This requires expertise and sustained attention as well as resources and the ability to mobilize them at the right time. The problem is that these tasks are nearly impossible for unorganized citizens to perform. As a result, as individuals, ordinary citizens have a very hard time actually influencing policy debates—even when their preferred candidate wins. Unions play a critical role in translating workers’ interests to elected officials and ensuring that government serves the economic needs of the middle class. They do this by encouraging their members and the general public to support certain policies as well as by directly advocating for specific reforms. Unions provide legal and regulatory expertise, create space for collaborative negotiations, ensure effective implementation of policies, mobilize members at key points in the legislative process, and act as a strong counterbalance to powerful interest groups that support policies that would harm the middle class. Historically and today unions are one of the few organized interests that have the capacity and the mission to launch sustained and successful policy campaigns during drawn-out political battles. Social scientists consistently show that strong labor unions are closely associated with low levels of inequality and more generous social programs that benefit the middle class. Indeed, University of Wisconsin political scientist Graham K. Wilson argues that unions in the United States have had more political success promoting broad social measures such as the Civil Rights Act of 1964 than they have promoting measures more strictly tied to their membership. A closer look at the role of organized labor’s engagement in the policy process clearly shows a strong concern about the prosperity of the middle class and indicates that, though their ability to influence policy has diminished, unions continue fighting for the middle class, and their efforts make a big difference. The charts and descriptions that follow highlight several middle-class-building policies that unions are instrumental in supporting. Unions are vocal supporters of the minimum wage and living wages. They have long championed minimum wage bills, from creation of the federal minimum wage with the Fair Labor Standards Act in 1938 to the most recent increase in 2009. 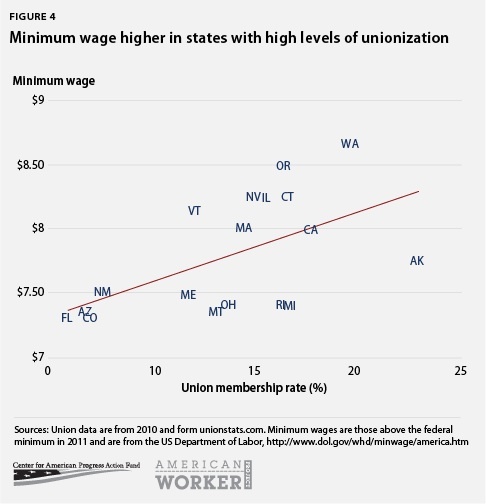 Not surprisingly states with higher levels of unionization are more likely to have higher minimum wages, as Figure 4 shows below. Due to the federal minimum wage, the relationship between higher unionization and higher minimum wages is more evident for states with minimum wages above the federal level. The decline of the inflation-adjusted value of the minimum wage is partially responsible for increased inequality especially at the lower end of the income distribution. Research has found that, while the effect may not be as large as previously thought, the decrease in the value of the minimum wage is responsible for a fair amount of the increase of inequality at the bottom end of the income distribution. Not only does the minimum wage affect workers at that specific wage, it also has a spillover effect on the wages of other lower-wage workers. Increasing the minimum wage, therefore, would help reduce inequality at the bottom and strengthen the middle class. Unions are also key supporters and defenders of the social safety net. Not only have they advocated for public health programs, but they also fight for strengthening programs such as unemployment insurance. These programs help lift people into the middle class as well as cushion the blow of a job loss for middle-class Americans. Historically, unions were supporters of the development of Social Security as well as state-level social safety net programs during the New Deal. 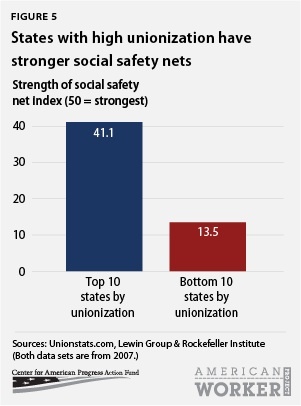 As Figure 5 shows, the relationship between union density and strength of the social safety net holds to this day. The figure uses an index of social spending that ranks the most generous spending state as 50. If higher union membership is associated with a stronger safety net, then we would see a positive relationship, which we do. States with higher union density do, in fact, tend to have stronger social safety nets. Unions secure decent wages for all workers, and they also help workers receive benefits including health care insurance. This occurs not just because unionized workers are more likely to receive health insurance from employers, but also because organized labor is a strong proponent of public policies that provide health coverage. Unions supported Medicare and Medicaid during the 1960s, and they were key supporters of the Affordable Care Act as it worked its way through Congress. They also push for greater Medicaid coverage in the states. Health care coverage not only protects workers from the potentially large out-of-pocket costs of health care, but increased coverage improves health outcomes and allows workers to remain on the job and earn more. 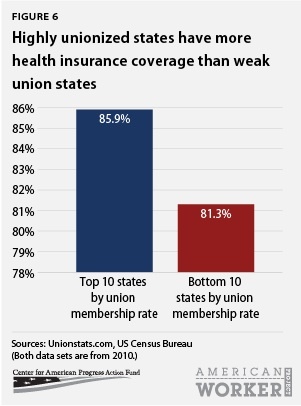 As Figure 6 shows, residents of states with higher unionization rates are more likely to have health insurance. Unions influence how government funds are spent, but they also affect how the programs are paid for. As a result, state tax systems are more progressive in states with higher levels of unionization. Academic research finds a strong relationship between progressivity of a state’s tax system and its unionization level. Using data from the Institute on Taxation and Economic Policy, we can see this relationship graphically. Our measure of progressivity is the ratio of the share of income paid in state taxes by the middle 20 percent to the share of income paid in state and local taxes by the top 1 percent. A large ratio indicates a regressive tax system; a smaller ratio means a more progressive system. Because sales taxes are central in many state tax systems, the poor and the middle class generally pay a higher share of their income in state taxes than the rich. 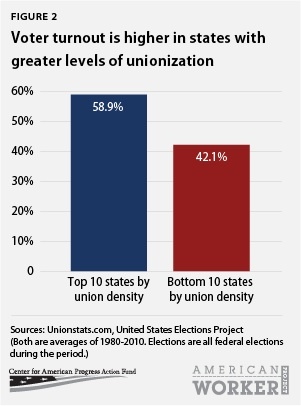 But this problem is generally less in states with stronger unions, as can be seen in Figure 7. As representatives of middle-class Americans, unions lobby for a progressive tax system in which the wealthy pay a larger share of their income in taxes. 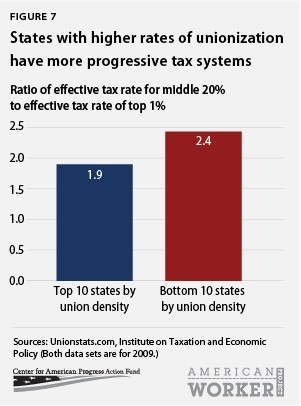 The top 10 states by union density had an average ratio of 1.9 while the bottom 10 states by union density had an average ratio of 2.43 in 2009—meaning that the state tax system was much more progressive (less regressive) in states with higher union density. One can think of this ratio as follows: If in a state with higher union density, a middle-class person would pay 9 percent of their income in state taxes, and a person in the top 1 percent will pay approximately 4.7 percent. In contrast, in a state with low union density, if the middle-class person pays the same percent of their income, a person in the top 1 percent would pay approximately 3.7 percent of their income. In short, a tax system is more likely to raise more money from the rich, instead of the middle class, when unions are stronger. Naysayers argue that unions are just another interest group, but the fact is that organized labor fights for the common interests of many Americans. 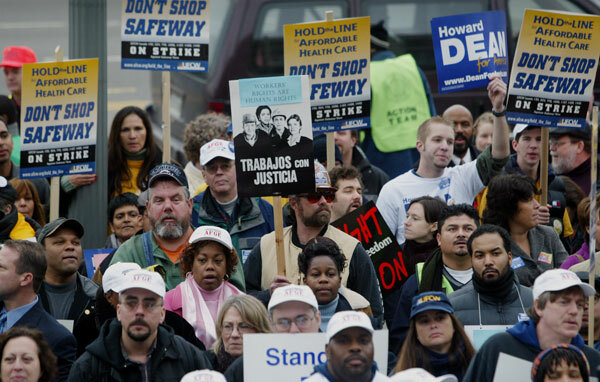 Unions have in many ways helped workers who have never paid union dues in their lifetimes. What’s more, the role unions play in making our democracy work is critical at this juncture when inequality is at record levels and an increasing number of citizens feel their democracy is no longer responsive to their needs. Indeed, in 2009, 59 percent said they don’t think most elected officials care what people like them think, up 10 percentage points from 1987—a time when unions were stronger and inequality lower. In short, rebuilding the strength of organized labor is necessary if we intend to make democracy work for the middle class. David Madland is the Director of the American Worker Project, and Nick Bunker is a Special Assistant with the Economic Policy team at the Center for American Progress Action Fund.